I once posted a recipe for bingka ubi jalar, this recipe is quite similar but using only eggs, hence we call it bingka telur. 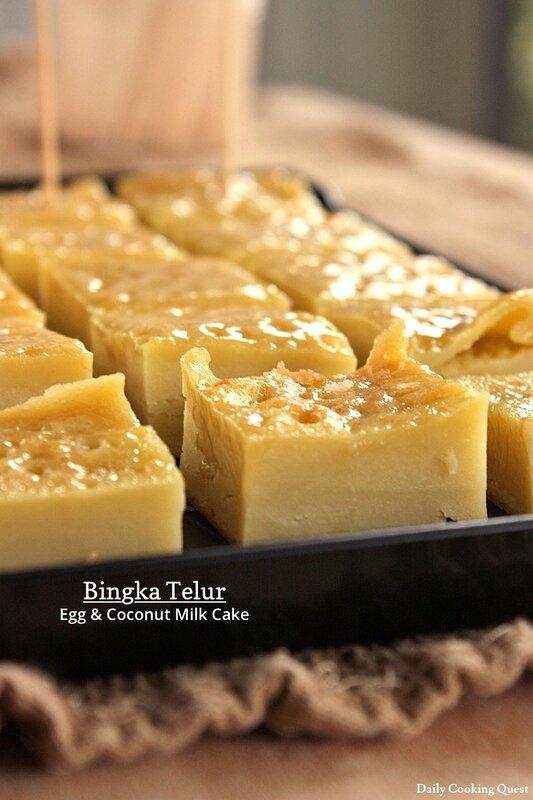 Just like bingka ubi jalar, baking bingka telur is just as easy. In Indonesia, we use a special flower shape baking pan to bake bingka, but here in the States, I usually just use a standard 9” round cake pan to make this. It works, just not as pretty. Again, like bingka ubi jalar, this cake will rise quite dramatically while it is being baked in the oven. Once it is taken out from the oven though, it will quickly deflate. I usually wait for the cake to deflate and cool slightly before taking it out from the pan and cut to serving sizes. Preheat oven to 320 Fahrenheit (160 Celsius). Grease and flour a 9" round cake pan. In a mixing bowl, beat together eggs and sugar until the sugar has dissolved. Beat in flour, coconut milk, vanilla essence, and salt, one at a time, making sure each is completely well mixed before adding the next ingredient. Pour the batter to the prepared pan and bake for 50 minutes, or until a cake tester came out clean. 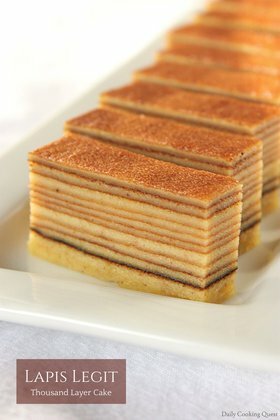 Once the cake is cooled to room temperature, cut into slices and served. wow this looks so interesting! and sweet too. perfect for my sugar-y sweet tooth. Awesome and easy! But do we use electric mixer or we just use our hands to mix? Thanx! Hi Hajar, I use a hand held electric mixer to mix. Thanks for that. I just ordered an immersion blender, and I'm planning on using that. I'm looking forward to trying this. Thanks for the recipe, too. 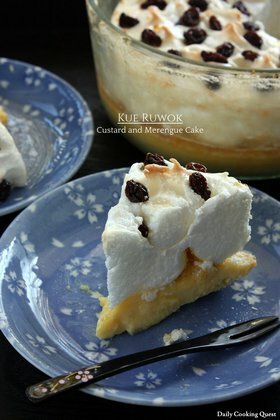 i am a Filipina and would love to try this recipe. Trying the recipe out now! Seems a little wet lol wish me luck. Hi Aaron, how did it turn out? I am South African and it taste exactly like our Sago pudding! Excellent recipe yours, thank you so much, will do this weekly. Kids love it and super healthy too. Glad to hear it Anni. It's amazing how our bingka can taste exactly like South African sago pudding! Hi Anita...thank you for sharing. 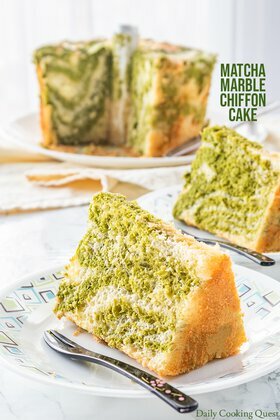 I would to try this simple yet look so yummy recipe. Just a thought ..do you think it would be ok to add in a little sweet corn in it - to have a fusion of sweet corn pudding? Hi Anita, any idea what flour could be subbed in place of wheat flour to make this gluten free? I was wondering if rice flour could be okay, or perhaps a mix of rice and cassava flours? Looks amazing!